My board is The duet wifi. Actually i use 2 independent z motors connect to z1 and E1. Do i need manual bed leveling to make the bed flat? If yes how to do that ? Ideally, you want the bed to be both flat and "level". Level means in tram with the printer's axes defined by the guide rail positions. The bed should be parallel to the plane defined by the X and Y axis guide rails, and should be perpendicular to the Z axis guide rails. Your printer lifts the X axis with two screws driven by two motors. The motors will get out of sync when the power is cycled which will tilt the X axis relative to the Z axis. You need to have some way to resync the two. You can copy the Prusa I3 technique- after turning on power and before starting a print, send the X axis to the top of the Z axis until it bangs into the physical stops, then bring it back down to the bed surface. That will get the X axis perpendicular to the Z axis. Now you also want the bed plate to be perpendicular to Z. If you have a probe on the extruder carriage, you can use mesh compensation to probe the bed at multiple locations so the printer's firmware can tweak the Z axis as as print progresses. That can correct unflatness and tilt. 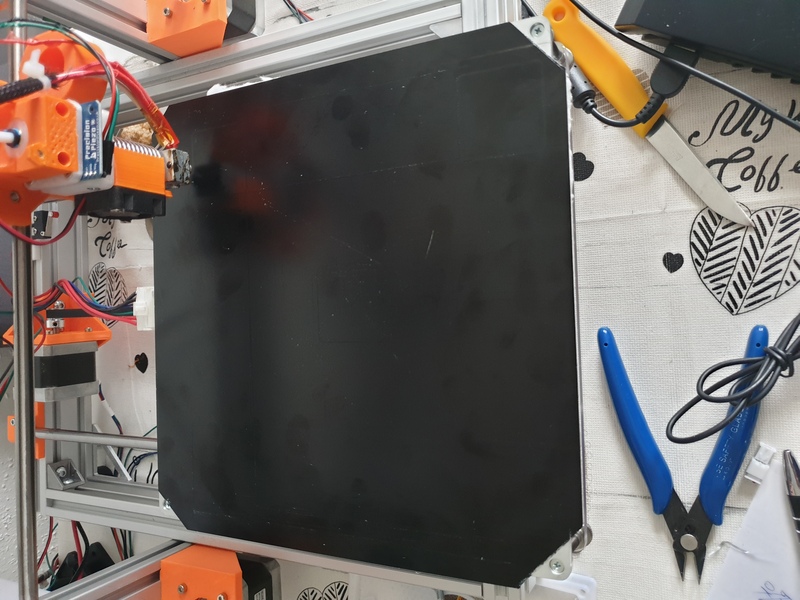 If you don't have a probe, you will need a flat bed plate and some way to physically adjust its position so the surface is parallel to the printer's XY plane. That is usually done using leveling screws. 3 screws is best, but 4 or more can be made to work with sufficient messing around. Duet's manual bed leveling assist can make adjusting the bed position pretty quick and easy. @phaedrux yes i have Setup with 2 z motors I will reply my config later. I hope this is possible ? With 2 independent Z motors, you can only level the bed in one direction (normally in the X direction) using the motors. So you need manual screws to adjust the bed tilt in at least the Y direction. is there a how to manual screws to adjust bed tilt ? See https://duet3d.dozuki.com/Wiki/Using_the_manual_bed_levelling_assistant. It's the same process as auto levelling with multiple motors. What happens is that when the firmware sees that the number of bed support coordinates you give in M671 is not the same as the number of Z motors in M584, it tells you the manual corrections instead of adjusting the motors. You don't have to use bed.g for both functions; you can put one of them in a separate macro file and then run it directly. The only thing magic about bed.g is that G32 runs it. @dc42 it's the reason why I have choose the manual bed level assistant with dual Z motors. The auto bed levelling can be done with 3 Z steppers or more. Those are how many turns you need to adjust each adjusting screw. The order of the screws is the order you gave the coordinates in M671. The first adjustment is always zero, so in M671 you can choose that screw to be the least accessible one. "Up" means in the direction that raises the bed. What macro, bed.g file or other procedure are you using to try to level it? Please provide that file or files. What happens when you try to level it? Macro i dont have it,do i need macro ? If the corrections it asks for diverge, that usually means you are turning the screws the wrong way, or turning the wrong screws. The corrections are listed in the same order as you list the screw coordinates in the M671 command. That said, a bed on 4 levelling screws is over-constrained so it may not react to adjustments the way that the firmware assumes. think i have it ,is that so ok ?